If you’re staying with friends or visiting over the holidays, take a linen basket and fill it with treats. If you’ve had enough chocolate you could buy pretty quail eggs, or pastel blue duck eggs for a beautiful and edible gift. 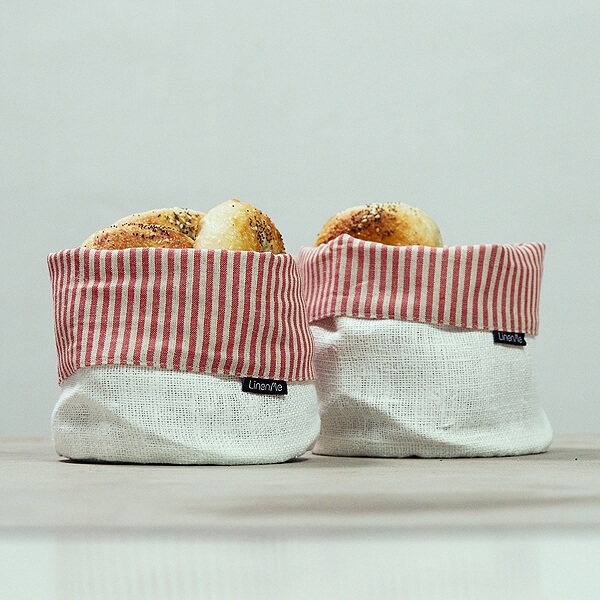 And they also get to keep the handy basket, which is great for storing dried food, toiletries, cosmetics or even socks. We always make a batch of these incredibly moreish cinnamon buns at this time of year. Honestly, they might just be the best things we’ve ever eaten. It’s partly the gooey, buttery, spiced sugar filling, partly the warm, soft dough. But what also makes these so special is the way they fill the house with a deliciously comforting smell. It’s how home should smell. Make a double batch, then wrap in kitchen paper and a fresh linen tea towel and take along on a family walk or outing for everyone to tear and share. For a pretty table setting over the holidays, use a pale grey linen tablecloth as a backdrop. Set mismatched crockery in muted colours and place blossom twigs down the middle of the table. 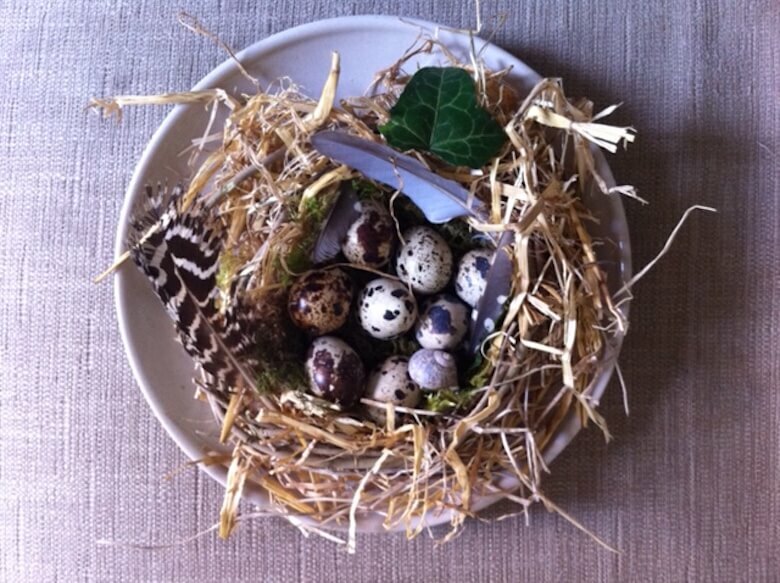 Gather moss and some bendy twigs, and twist into a small nest, then fill with tiny quail eggs, feathers you’ve found, petals and any other foraged treasures you can find (or these lovely chocolate eggs if you fancy!) for a sweet centrepiece. To mark each person’s place we love these hand-painted watercolour eggs placement cards. Egg blowing and painting is a fun way to spend a rainy day in the holidays. If you want to blow your egg, make a hole at each end with a pin, slightly larger than the pinhead so you don’t have to blow too hard. Hold the egg over a bowl and then blow firmly into one end until all the white and yolk have come out. Save this for a tasty omelette or scrambled eggs for brunch. These blown eggs are very fragile so if you’re painting with smaller kids you might want to go for hard-boiled ones instead. Add some onion skins to the boiling water for a lovely depth of colour to the eggs, then cool and paint. We have a tradition where we each pick a family member and then paint their face onto a boiled egg. Then we hide them in a nearby field and hunt for the egg version of ourselves. When everyone has found their egg we roll them down the hill. The winner is either the one that remains most intact, or the first to the bottom, depending on people’s mood. Things get quite competitive and the kids love smashing the eggs. Quite therapeutic after a few days cooped up together! 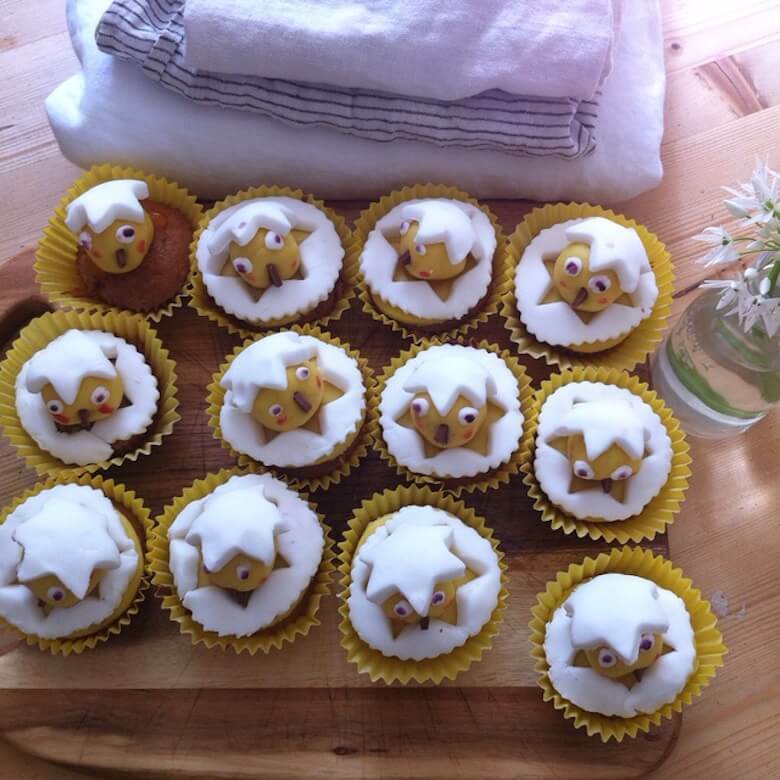 If you want to have a go at making these super cute chick cakes, just make some regular fairy cakes, then cut out stars from a sheet of royal icing. Place the cut out bits on top of the cake, then make a chick head from yellow marzipan and add eyes made from icing with black food colouring for the dots. Stick on a small piece of chocolate (the shavings from a Cadbury’s Flake are perfect!) for the beak, and top with the icing star. Add a little bit of blush to the cheeks with red food colouring. What do you like to do over the Spring break? For more ideas on Spring linens and cooking go here and here.